What are the marks we leave behind? What are the cultural literacies we have absorbed in our life to make our work possible? How do these contribute to the inner landscapes of our minds? These are some of the questions my talk will address while showing the labor of art in productions ranging from Asia, Mexico, the US and Europe. Alluding to images in my own work that expresses both a physical and mental state inspired by nature, I will attempt to explore a fundamental quality and lineage of information that guides us in our complex lives and binds us as participators in a larger evolutionary process. Linking indigenous traditions with Western ones also serves to have us look at cultural and economic consequences. This presentation examines ideas behind the theory, practice and production of works in paper to explore the shared boundaries between traditional and new art media. It highlights how the technical prowess of hand formed elements and their inherent aesthetic demands challenge and fascinate many artists working in hand papermaking today. Beginning with some notes about the history of materials, writing and printing and the need for paper, the lecture reveals which artists have achieved presence for hand papermaking as an art form. The presentation also includes important teachers and institutions that have given a major focus on contemporary artists and their artwork. Artist books are indeed part of the big adventure and intent in the world of contemporary art, especially collaborative art. This lecture will discuss visual literacy in terms of viewing the artist book. It focuses on the fact that the artist book is at once a learned and immediate experience – and the book never fails to complete a personal interaction that is boundless. Organizing the book so people will feel compelled to open, view and continue through it, clearly understanding the voice of the narrator(s) depends not only on choice and arrangement of images, fluency and pacing but on the internal comprehension of time and space as forged by the context. This context that first germinates with the artist is birthed in practice and fully realized in collaboration within the realm of print and other technologies and the guidance of one or more skilled practitioners. Depending on the size of the audience, examples of the books will be presented. The lecture itself will include work being made in the United States and abroad. Represented artists include painters, poets, printmakers, sculptors, photographers, and designers as well as those who concentrate solely on the art of the book. Frederick will connect the East and the West, as related to traditional and contemporary works in paper. She will explore ways to recycle, mold, suspend and illuminate paper as a substance from the point of view of an artist who is involved in the historical and collaborative aspects of making paper, prints and three-dimensional objects. The lecture will explore many artists’ work and discuss what attributes of paper have captured their imagination for installations and personal dimensional works, among other applications. 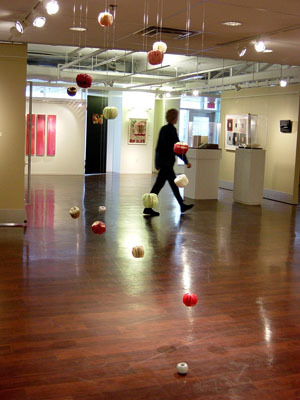 At a time when the computer can produce three dimensional rendering, Frederick will demonstrate the technical prowess of hand formed elements and the basic technical and aesthetic demands and challenges that fascinate artists working with the elements of hand papermaking. From paper formation to the computer, artists are now blending various techniques for acquiring form, layering and color. This workshop is seen as shared exploration between the participants to mine ideas for dimensional paper sculptures. Sheet forming with aspects of pulp painting, watermarking and the use of over beaten fibers will be explored. This will be followed by a demonstration of forming sheets over several armature forms (wire and bamboo) or layering them into negative molds. Discussion and examples of types of papers and ways these papers can be inventively used in the three dimensional forms will be incorporated in the session (instructor will bring various examples). Students should come prepared for exploring wet paper pulp and resources from their sketchbook and personal experience to create a small sculpture. Bring some preliminary found materials like small ceramic or plaster forms or found textural wood, memorials and the like. Also bring personal concepts that you would like to develop or discuss as trouble shooting during the workshop. Printmakers and book artists appreciate the power of retrieval. Taking impressions, we make prints. It is a heightened activity that provides new syntex and increased associations. Lawrence Weschler’s book “Everything That Rises: A Book of Convergences” is a guide for this lecture /workshop, since it weaves together impressions of images from all eras and shows the reader/viewer how our vision always re-contextualizes, repeats and informs what we interpret in our world through images. Workshop participants will engage in analyzing images, fitting them together by selecting print processes that best layer and juxtapose meaningful contemporary commentary. Materials and processes will include etching, monoprint, digital printing and relief. Students will collaborate with each other as a convergent experience and leave the extended workshop with exciting work and dynamic new concepts. The lecture will present an overview of the work produced and created by visiting international and Washington, DC area artists, students from George Mason University and area universities. Frederick and master printer Susan Goldman have had the unique opportunity to work together for well over 18 years. 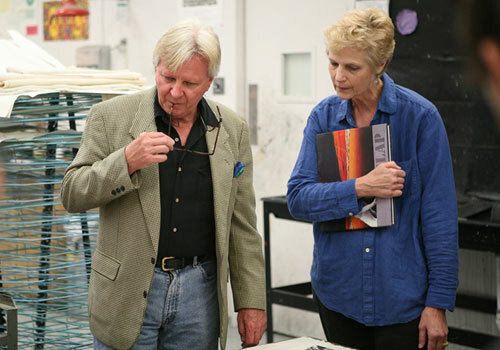 As master printmakers, papermakers, and as professors developing their program, they have generated innovative artists projects that are included in major museum collections all over the world. The focus of this lecture will examine their mixed media approach to both hand printed and digital imagery. This experience is precisely what invigorates their approach to their curriculum. This presentation features print and artist book projects that have captured their students' imagination and engaged them for installations and collaborative community works. At a time when the computer can produce three dimensional rendering, Frederick will discuss the technical prowess of digital media as it relates to aspects of visiting artist residencies and student directed projects at and within the university and among the community at large. Drawing on examples of artists who employ narrative navigation in digital printmaking and digital bookmaking, the talk will also explore how visual technology is altering the terrain of modern thought and contemporary art. Gropius announced in the first Bauhaus exhibition ”Art, technology, a new unity.” With the new qualities of printmaking feeding into and from video, animation and sculpture, an open-ended field of visual possibilities exists that would delight the father of modernity. Frederick will review printmaking in terms of its early 20th century explorers and contemporary players and the ways that they are accustomed to using images for qualities of flexibility and multiplicity whether hand made or electronic. As a visiting artist, Helen Frederick has a wide range of experience in facilitating students in a group or one-on-one basis. This experience reaches out to a broad range of disciplines in contemporary art, print media, artist books, hand papermaking, non-profit work and art education. Individual critiques can be scheduled for at least one hour. Group critiques should allow for a morning or afternoon with sharing of works interactive exchange and personal reviews. Other tailored workshops in printmaking, papermaking and artists books can be designed for special groups, universities and students of many ages.